The company has raised this round to continue its growth; it’s now shipping 40,000 to 50,000 of its learning thermostats per month. If the company’s growth continues at this current rate, Nest could reach a shipment rate of 1 million thermostats per year by the summer, say our sources. Note, that’s shipments, not sales, though the figures are clearly closely related. Some of that growth is happening in Europe, in addition to its shipments in the U.S. Nest sells its thermostats through big-box retailers like Lowe’s (s low) and Best Buy (s bby), as well as through the online Apple (s aapl) store and its own online website. It’s also struck some initial partnerships with utilities like service provider Reliant. Updated: Nest clarified with me that it doesn’t officially sell its thermostats in Europe but is seeing growing interest from individual customers in Northern Europe who have bought the thermostat. The previous version of this article inaccurately implied larger growth in Europe. Nest also plans to use the funds to offer a more comprehensive smart home service along with its product, which could include lighting and alarm systems, too, we’ve heard. I don’t know too many details about this, but will add more if I hear more. We’ve reached out to Nest and are waiting to to hear back on these figures. Venrock investor Matthew Trevithick responded in an email and said “Nest doesn’t comment on funding.” Other investors that have backed Nest include Kleiner Perkins, Al Gore’s investment fund Generation Capital, Lightspeed Venture Partners and Shasta Ventures. Nest previously raised tens of millions of dollars before this round. Earlier this month Nest announced that it had brought in a new CFO, Tom vonReichbauer, last at Tesla (s TSLA). 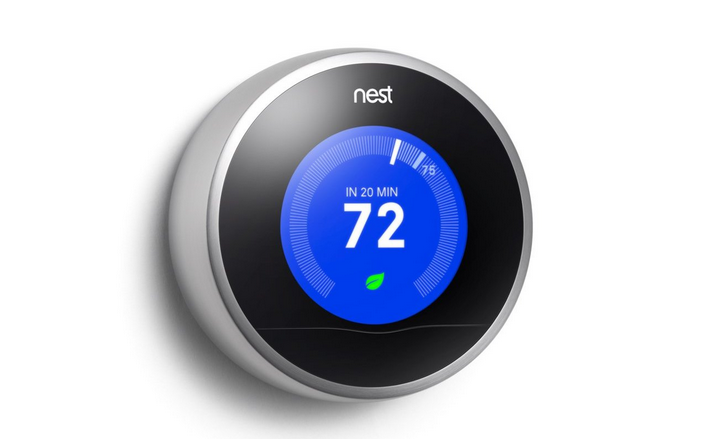 Nest only officially launched in late 2011, with a plan to sell its sleek learning thermostat designed by former Apple designer Tony Fadell, who developed multiple generations of the iPhone and the iPod. The thermostat, which costs $250, learns its owner’s behavior and uses smart algorithms to shave off 20 percent to 30 percent of energy used for heating and cooling. The team that built the learning algorithms included Yoky Matsuoka, the former head of innovation at Google, and Stanford Professor Sebastrian Thrun is an adviser to the company. Nest launched the second generation of its thermostat a few months ago, which has a slimmer body and is compatible with 95 percent of heating and cooling systems in the U.S. They’re also now on version three of the software. Nest’s growth is one of the few success stories to come out of the cleantech sector in awhile. Updated at 11AM, April 10, 2013, to correct that while Nest is seeing interest from customers in Northern Europe, its thermostat is not officially on sale in Europe, and it’s not sending considerable shipments there. Nest didn’t disclose how many customers in Europe have bought its thermostat. have saved significant amount of dollar (euh, Euros). one frustrating fact, to me , is that the learning schedule feature is messed up by virtue of the EU time zone not being supported and frankly speaking I Am not in the hacking spirit, nor am I ready to share some of my ‘nest access’ with some of the companies that are offering services supposedly “making nest work fully” in EU (time zone, weather etc). I Will in the coming week or so post my first 3 month of “winter” gas consumption… if this means anything to anyone. I do like the no-ties / no-contract and I am convinced more useful products will come out of this company! Climote doesn’t have auto-sensing of motion, nor does it allow different temperature settings for chosen time periods – if you set the stat to heat the house until e.g. 18c, then this temp applies to any point when the heating is on. As such, if you want the house to be 18c when people are up out of bed, then 16c overnight, it won’t do it. Bit of a shortcoming I feel, though seemingly nobody else they asked wanted this feature. Climote also has no learning but does have SMS/web-based control even though there’s a Â£30 per annum fee for this as it uses GSM, not Wi-Fi. @Max Mllr, Yes, sorry for the delay. The original article overstated europe shipments. They have customers there but it’s not officially on sale there. Nest wouldn’t tell me how many people are using the thermostat in Europe. Comcast is offering remote control of heat, lights and alarm systems, now. I’ve got the Philips Hue and could definitely see the next Nest product being centered around lighting. Unlike the Nest Thermostat pretty much everyone could be your customer. I quickly found out the line-voltage thermostat system used in my apt wasn’t at all Nest compatible. The market for Thermo only will inevitably shrink but expanding out into lighting and perhaps door security and surveillance are areas of opportunity. The one thing i’m getting from consumers though is “no monthly fees” they want user installable products. Nest 2 happens to support my home – and my wiring does not have the “C” wire – this is the one provides power. It is amazing to see that Nest function at my home – they have an interesting low power design to allow that. Also note that Nest 1 or 2 – both have Zigbee Controllers – and sooner or later can be supported to integrate and control the Philips Hue. In theory they can be – not sure it would actually happen though. @yngjoh, I’ll look into it more and get back to you on that. Some of us are intrigued by the Nest Apple-like design, http://www.wired.com/geekmom/wp-content/uploads/2012/12/Screen-Shot-2012-12-08-at-3.02.40-PM.png. The Tado does not offer that. http://d3uifzcxlzuvqz.cloudfront.net/images/stories/jreviews/1326_tado-smart-thermostat-1-1353001433.jpg. Do you have any figures on that? In which European countries is the growth biggest? And how can that actually be when as far as I know the Nest thermostat is not configured to work in Europe? You need some hacking skills to make it work there, as far as I have understood, ref http://motote.blogspot.com.es/2012/09/nest-thermostat-in-europe-hacks-ii.html and http://motote.blogspot.com.es/2012/11/nest-hack-in-openwrt.html.